I did a finish coat on the stars that I am making and the water based spray paint is working well with the lacquer, at least so far. I will do one more lacquer coat and it will be time to assemble them. 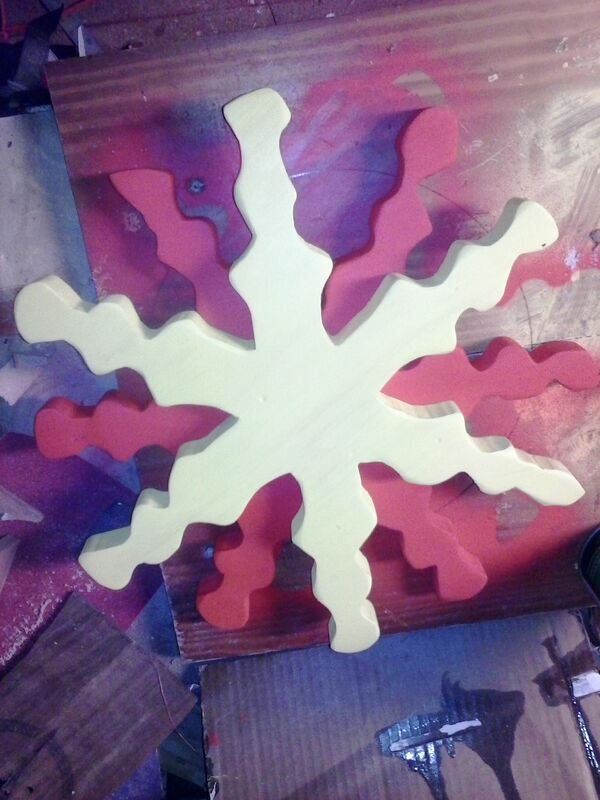 So far I have made 4 of these stars and I really like them. The first pair were a gift and I used stain and lacquer. I had every intention of keeping this pair natural but I really wanted to play with my new paint and since I do a lot of work with red and yellow I figured why not. I cut out ornaments this week too. I am playing with a new Christmas tree design and using negative space to work on a maple leaf ornament. Ideally using negative space wastes less wood as you have the ornament which has the shape cut out, and you have the shape which you can use as an ornament or as inlay in something else. 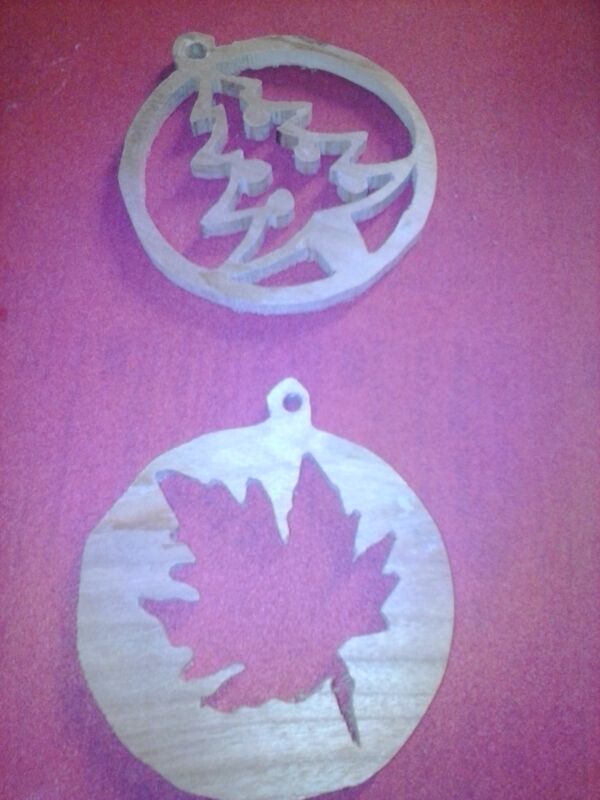 I messed up the shape when I cut it but a maple leaf is one of those things that looks far easier to make than it is. A natural leaf has symmetry but there are little imperfections that are really hard to duplicate, so hopefully these will get better as I work on them. I am not sure what type of wood this is? I actually found it and there is some water damage. It is definitely craft wood as it is so thin. it’s a mystery. I also cut out a pumpkin puzzle and laid out a Menorah puzzle I have been thinking about. I made a small Menorah candle stand a few years ago and I really liked it, I attempted a Menorah puzzle too but the pieces were too narrow and I really wanted to use Olive Wood. I still don’t have Olive Wood in fact I think I am using some rough cut pine that I had in the shop, but I did make the base a bit wider and hopefully there is more support. Wish me luck. This entry was posted in for sale, ornaments, process, scrap wood, wall art, wood working by brighid. Bookmark the permalink.